Furnace: Unknown Water Heater: Electric Water Lines: Seems O.K. Drain Lines: Seems O.K. Gas Lines: Seems O.K. Historic 1495 sq. 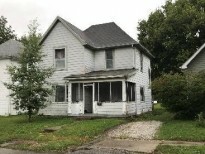 ft., 3 - bedroom, 1-bath, 2-story home built in 1899. Home has a screened in front porch, partial basement and 1-car detached garage. Small town living in Alexandria. Back deck with poured slab for hot tub!